The advent of the neoclassical approach to establish economics as a science, led to the disappearance of many psychological insights already made by economists, for example Smith says “we suffer more… when we fall from a better to a worse situation, than we ever enjoy when we rise from a worse to a better.” And Edgeworth points out that one agent’s utility can be affected by another agent’s payoff. One development of neoclassical economics was the formulation of the expected utility framework which makes precise assumptions that can be falsified, it assumes stable and consistent preferences, the ability to perform complex computations, and an ability to memorise a large amount of information. We have already seen examples when these assumptions are not a realistic description of human behaviour, for example the Allais and Ellsberg paradoxes, whilst a large number of psychology studies show that our memory, problem solving and decision making processes are far from perfect. Our brain uses heuristics (shortcuts) to cope with complex tasks, whereby we revert to previous situations (or what we consider to be a similar past situation) and our response to solve a situation. Whilst these work well most of the time, they may backfire and cause systematic biases. Endowment Effect – is the tendency for people to ascribe more value to items that they own compared to equivalent items that they do not own. Kahneman, Knetsch and Thaler conduct two experiments: in the first half of the subjects are assigned to be buyers and half to be sellers. They are given a value for a token (how much the token is worth) and this value varies across subjects. Buyers (sellers) then write down the price they are willing to buy (sell) for, and at the end the experimenter calculates the clearing price. In a second experiment, the same participants have the chance to examine a mug. Half of the subjects are assigned to be buyers and half to be sellers with buyers (sellers) writing down the price they are willing to buy (sell) the mug for. When we compare the market for the token and the market for the mug we find that only 20% of the predicted volume of trades occur and the median selling price is almost double the median buying price. 89 percent of those originally endowed with a mug chose to keep the mug, and 90 percent of those endowed with a chocolate bar (in a separate experiment) decided to keep the chocolate bar. They conduct a separate experiment which reveals that the low volume of trade is driven mainly by a sellers’ reluctant to part with their endowment, rather than buyers’ reluctance to part with their cash. This effect matters when considering the Coase Theorem which states that the allocation of resources to individuals who are free to bargain and transact at no cost should be independent of initial property rights. But if there is an endowment effect then the marginal rate of substitution between one good and another is affected by the endowment, so the individual who is assigned the property right to a good will be more likely to retain it and this will lead to under-trading and inefficient allocations. 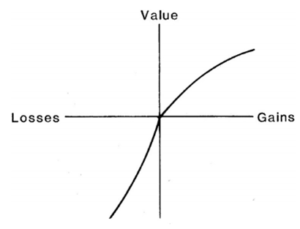 As a result we can have crossing indifference curves, because preference orderings will depend on the endowment. To test the significance of this effect we would want to conduct a field experiment to see if we observe the effect out of the artificial lab and in a real market setting, with experienced participants who learn about the market. List conducts an experiment whereby he asks a participant at a sports card show to fill out a survey in exchange for a good (one of two sports card assigned at random) as compensation. Once the participant has been given the card, the experimenter reveals the other good and asks the subject whether he wants to trade it. He finds that dealers are likely to trade the cards more frequently (around 45% swapped) than non-dealers (only 20-25% swapped). This difference is present even between experienced versus inexperienced customers with experienced non-dealers swapping 46.7% of the time whilst inexperienced non-dealers swapped only 6.8% of the time. In the exit interview, 95% of subjects declared that they intended to keep the good and in a follow up study, only one subject had sold the good. The evidence shows that market experience plays a significant role in eliminating the endowment effect since each participant is randomly allocated the good, we would expect fewer than 50% to trade if the endowment effect existed, and around 50% to trade if the endowment effect wasn’t present. At the 45% level we can’t reject the null hypothesis of an endowment effect with Fisher’s exact test. Status quo bias – when faced with a choice among different options, people have a tendency to stick with the default. This effect is driven by the (sometimes marginal) cognitive costs involved in thinking about the choice and considering switching. This bias is amplified when there are more choices available and/or the choice is more complex. Evidence of opting in to be a donor, or opting out (i.e. 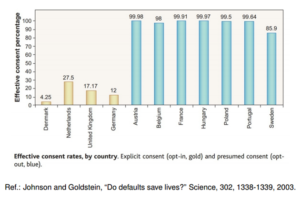 the default is that you are a donor unless you say otherwise) shows that the percentage of people consenting to be donors does not completely reflect their choice, but the default: 42% consented under opt-in (so made the concision decision to switch options from the status quo), 82% remained donors under opt-out and 79% chose to consent when the status quo was neutral. This demonstrates the power of the status quo bias. This bias is important for economics, because many choices that we make have a history and therefore a default that we are reluctant to change: insurance, pension plans, investment, product brands in consumer choices, bank savings accounts etc. Representativeness is a heuristic according to which the subjective probability of an event is determined by the degree to which it is (a) similar in essential characteristics to its parent population and (b) reflects the salient features of the process by which it is generated. Since sample size does not represent any property of the population, it is expected to have little or no effect on judgement of likelihood: subjective sampling distribution and posterior probability judgements are determined by the most salient characteristic of the sample without regard to the size of the sample (Kahneman and Tversky). Many decisions under uncertainty rely on computation. Individuals who use the representativeness heuristic evaluate these probabilities by the degree to which A is similar to B. If A is judged to be similar to B then the probability is believed to be high and representativeness leads participants to ignore sample size in the formation of the posterior. An example of this is that the statement “A study of the incidence of kidney cancer in the 3,141 counties in the US reveals a remarkable pattern. The counties in which the incidence of kidney cancer is lowest are mostly rural, sparsely populated, and located in traditionally Republican states in the Midwest, the South and the West.” This would seem to suggest that the rural lifestyle is better than an urban lifestyle, and omits the difference in sample sizes. Another consequence of representativeness is that people often make predictions based on descriptive information, for example the performance of a stock based on the company’s description. This is independent of the reliability of the description. Furthermore, people tend to see realisations of a random process as more representative of the overall process than they really are (i.e. less random than they should be): for example the coin tosses H-T-H-T is just as likely as H-H-H-H but because we observe a pattern in the last sequence we might consider it less likely than H-T-H-T. Another example is that individuals think the “shuffle” function is flawed if, say, two songs by the same artist were played consecutively – because they have identified a pattern – even though in a random sequence this is likely to occur occasionally. Evidence by Tversky, Gilovich and Vallone show that 91% of (sampled) people believe a football player who has just made 2 or 3 shots has a better chance of making a shot than a player who just missed 2 or 3 shots; thereby attributing this success to skill rather than the random element which must be involved. In reality the probability of a hit given 3 misses is 0.56, given 2 misses is 0.53 and given 1 miss is 0.4: showing that the probability of a hit is largely random (50/50 chance) and not dependent on previous outcome. If anything, mean reversion means somebody who has missed a few shots ought to get the next shot, just by random luck. Availability is a judgemental heuristic in which a person evaluates the frequency of classes or the probability of events by its availability: the ease to which relevant instances come to mind (Tversky and Kahneman). This can lead to systematic biases arising because the saliency of an event is associated with its availability from memory, which may differ from the actual frequency; because dramatic events come to mind more easily or quickly; and personal experiences come to mind more easily than experiences that happened to others. This is an important heuristic in economics because it can lead to incorrect subjective probabilities being formulated depending on the availability bias. An experiment was conducted asking a group to list x instances in which they behaved assertively, where x=6 or 12. Participants who were asked to find 12 instances rated themselves as less assertive. This suggests that subjects initially found it easy to retrieve instances of assertiveness due to the availability bias, but towards the end of the list their expectations changed, leading them to correct the bias. This suggests that awareness of the bias can lead to its disappearance. Anchoring occurs when people make estimates by starting from an initial value and adjusting this to give a final answer. The initial value may be suggested by the formulation of the problem, or it may be the result of a partial computation. In either case, the adjustment is normally insufficient such that different starting points yield different estimates, which are biased toward the initial values. A general finding is that people tend to overestimate the probability of conjunctive events and underestimate the probability of disjunctive events. This is likely to be because the stated probability of the elementary event provides a natural starting point to the assessment of the probability of the conjunctive/disjunctive event, but, since adjustment is typically insufficient, the estimate remains too close to the higher probability of the elementary event for conjunctive events (overestimation) or lower probability of the elementary event for disjunctive events (underestimation). The successful completion of a task such as the development of a start-up or writing up a dissertation is a conjunctive probabilistic assessment, and so anchoring means there is likely to be overestimation and hence over optimism. Conversely, risk evaluation is a disjunctive probabilistic assessment, and this leads to underestimation of the risk of failure of complex systems. Perhaps more importantly, anchoring can have an impact on other decisions such as estimation of willingness to pay in transactions, bargaining and sales pricing. Market prices, posted prices and the history of previous transactions can serve as anchors, and this leads to inertia: if there is a history of similar transactions between a firm and a client then the most recent price is the anchor, whilst if it is a new transaction then the going market price is the anchor. The way an issue is framed can lead to different outcomes, for example in the insurance market different formulations that overemphasize the certainty of protection can influence consumers. The consequences of framing are that people are more sensitive to losses than to foregone gains; and that subjects have separate mental accounts to evaluate general economic conditions. Kahneman, Knetsch and Thaler find that an action by a firm is more likely to be judged unfair (which may affect reputation and thus revenue) if it causes a loss to the employee than if it cancels or reduces a potential gain, and that an action by a firm is more likely to be judged unfair if it achieves a gain to the firm than if it averts a loss. A consequence of behavioural biases is that unemployment compensation, which offers a fraction of an individual’s wage (usually to prevent issues of moral hazard), is inconsistent with the observation that individuals evaluate new job offers using their previous job as an anchor and that they suffer from loss aversion (so wouldn’t want a wage drop). This means that economic theory which assumes that individuals form reservation wages based on labour market conditions may be flawed, and instead the reservation wage is anchored at an individual’s previous wage. As a result individuals hold out waiting for unrealistic offers (due to the new labour market environment) and so stay unemployed for longer. This phenomenon is reinforced by social status and identity being tightly linked to their previous job (so the issue is particularly severe for long-tenured workers displaced from high wage sectors). One solution to this may be wage loss insurance: a subsidisation of workers’ earnings upon reemployment when the wage they receive on their new job is less than that of their old job.